I just made a big leap in my understanding of figure and portrait drawing so wanted to share previous sketches and paintings before the new work. Above is a photo of the “figure drawing wall” in my studio. I’d covered this wall with black non-fade bulletin board paper to avoid reflected light when I’m at my easel (that stands just to the right of this photo). Then I hung black metal grid panels that I got super cheap on Craigslist and use little magnets to stick the drawings to the grid wall. Now it’s easy to add, move or replace drawings with better ones as my skill improves and I can hang framed paintings from it with grid wall picture hooks. 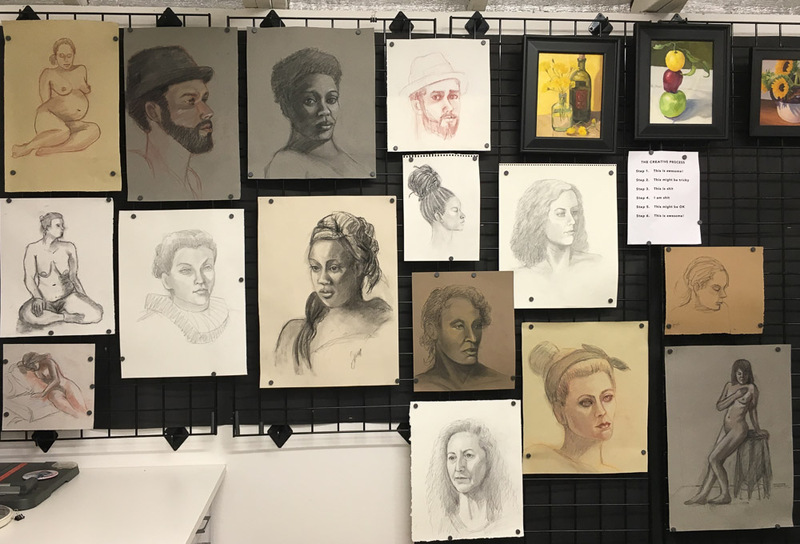 Below are assorted figure and portrait drawings from past Friday Figure Drawing sessions. Click on any image to go to slide-viewing mode and click through them using the arrows on each side. Hi! Come on in and let me show you around my new studio. 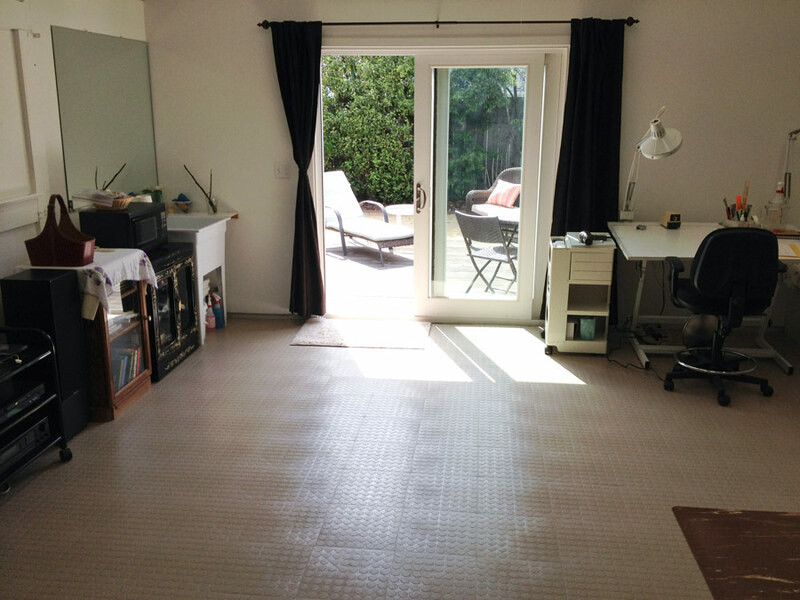 The concept for the studio began in 2000 when I bought my cottage, a 1940s duplex. I planned to use the front unit as my home and the rear unit as my studio while still working at my “day job.” When the time came that I could leave to paint full time, I planned to rent out the back apartment for extra income and convert the 400 square foot garage to my studio. 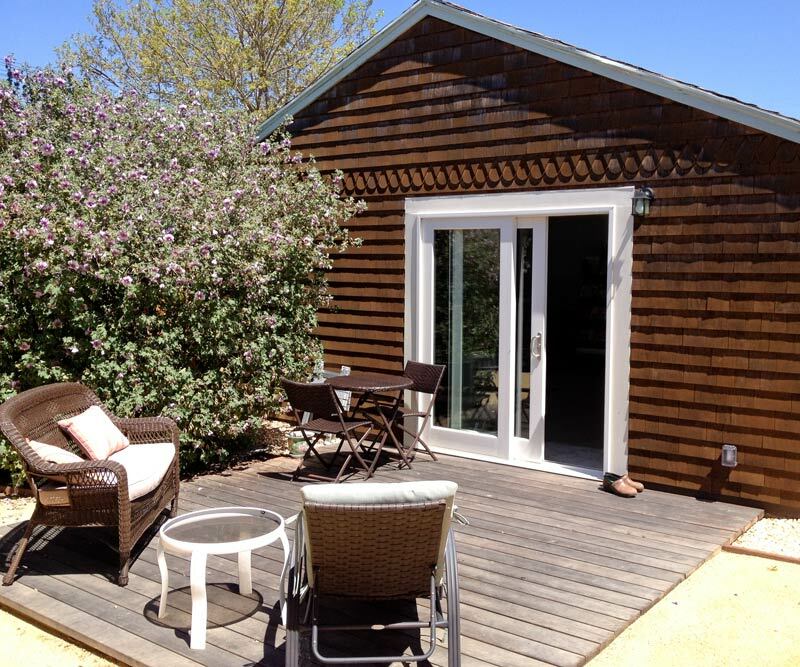 The rear unit studio was wonderful and I spent many happy hours painting and teaching there. But the new studio is even better! Even though it’s near my house, it’s completely separate so the distractions of laundry, dishes and computer; the nagging of cats for dinner; email and phone calls disappear and painting time flows uninterrupted. Before the tour, here are “before” pictures of its former life as a grease-monkey garage where my son worked on cars. The bare garage walls had 40 years of grease and grime and Bondo dust and the concrete floor was badly stained and cracked. The only electricity came in from an extension cord. The only entrance was the heavy and awkward sliding barn doors on the driveway side of the garage. Now I’ve transformed the old garage from a place for pursuing a passion for pistons to a passion for paint. I added the doors and deck (though the contractor’s mistakes led to it not being a two-steps up raised deck as planned–but it is level unlike how it seems in the photo). The high-maintenance funky grass is gone, replaced by gold fines which makes it feel like a beach. Now it’s a great place to set up a still life and paint outdoors and I love eating lunch and reading out here too. Here is a 6 minute video tour, and below that, pictures with more detail. Happy Boy Farms Radishes, oil on panel, 8x8"
Every time I paint I learn something. This time I learned some new tricks with different brushes and mediums and also about how much easier it is to paint in a good mood than a bad one. 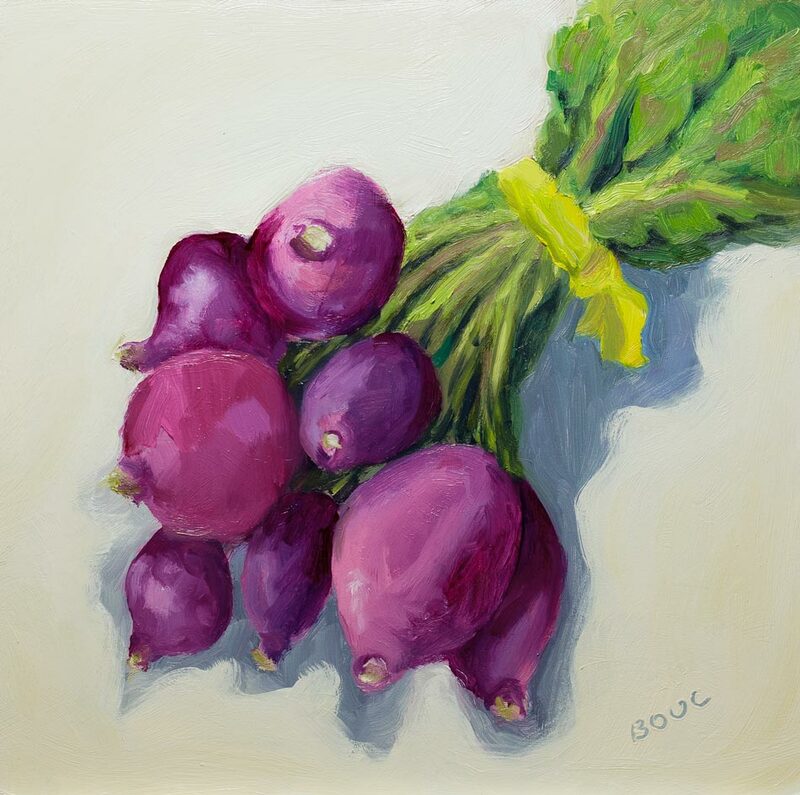 I painted the radishes for last week’s Daily Paintworks challenge, “Paint your vegetables.” It is available there on my new Daily Paintworks page. 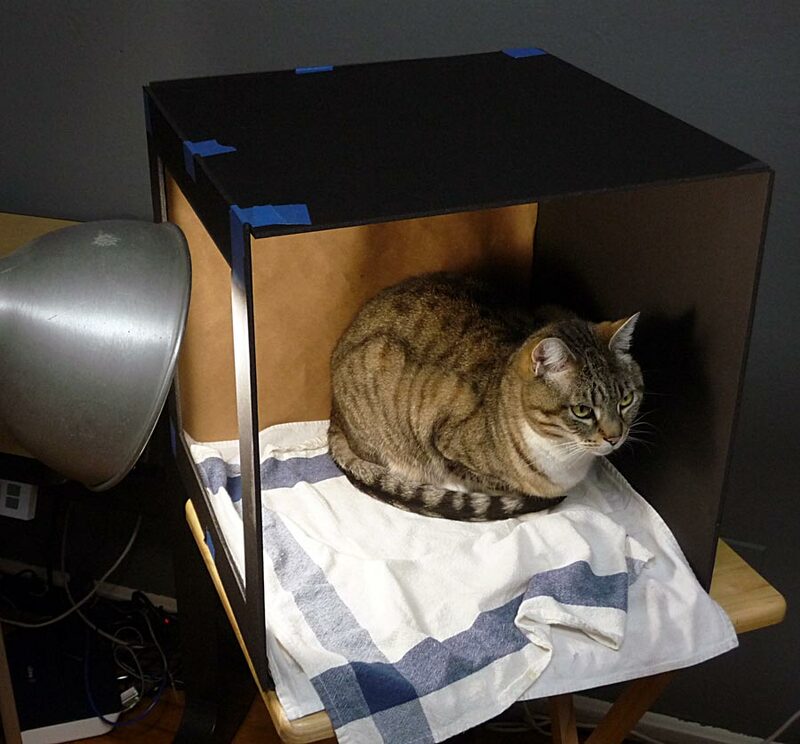 And here is the promised Still Life With Cat, shot when I put the radishes back in the fridge and silly Busby decided my still life light box would make a nice kitty sauna. I’d probably look grouchy too if someone tried to take a picture of me in the sauna! 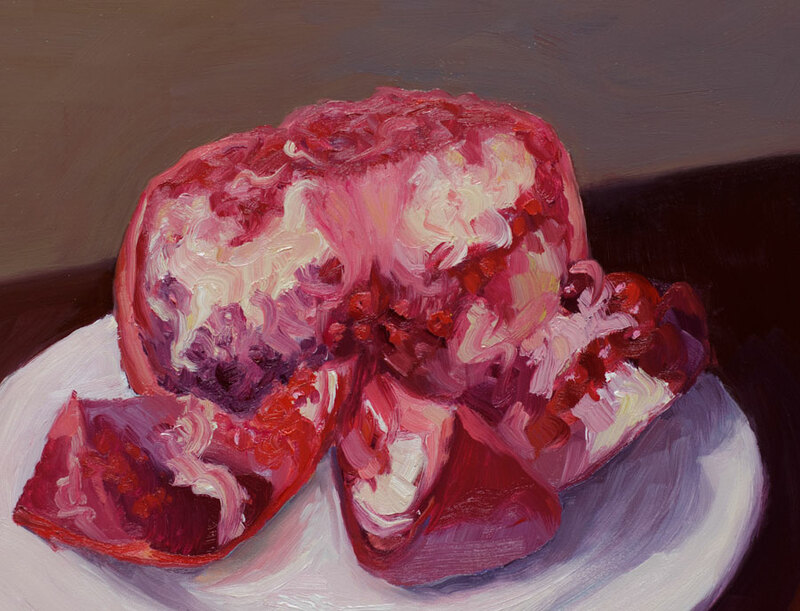 Pomegranate Revealed, oil on board, 9x12"
Happy New Year! Thanks for hanging out with me this past year! 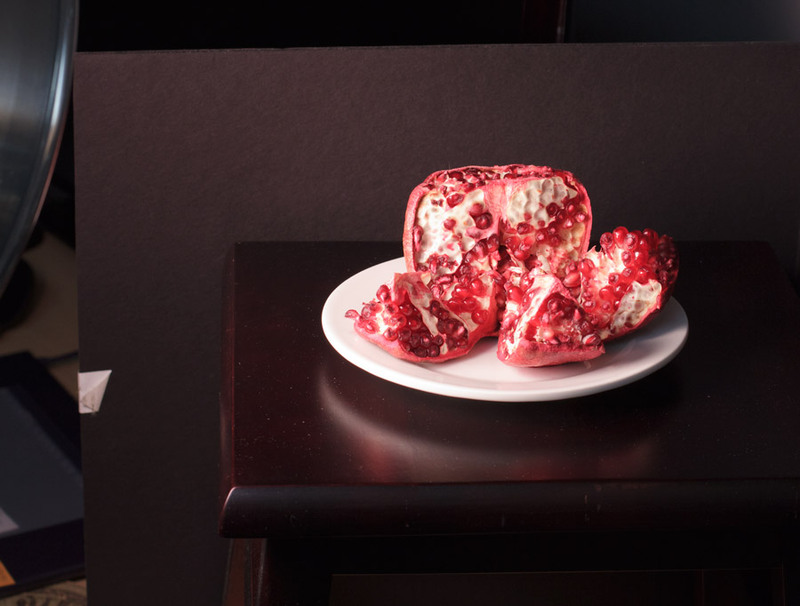 Even though I’ve had a nasty cold all week I managed to get in some pomegranate painting between nose blowing, naps, and chicken soup breaks, but not nearly as much as I’d hoped to do over my year-end vacation. 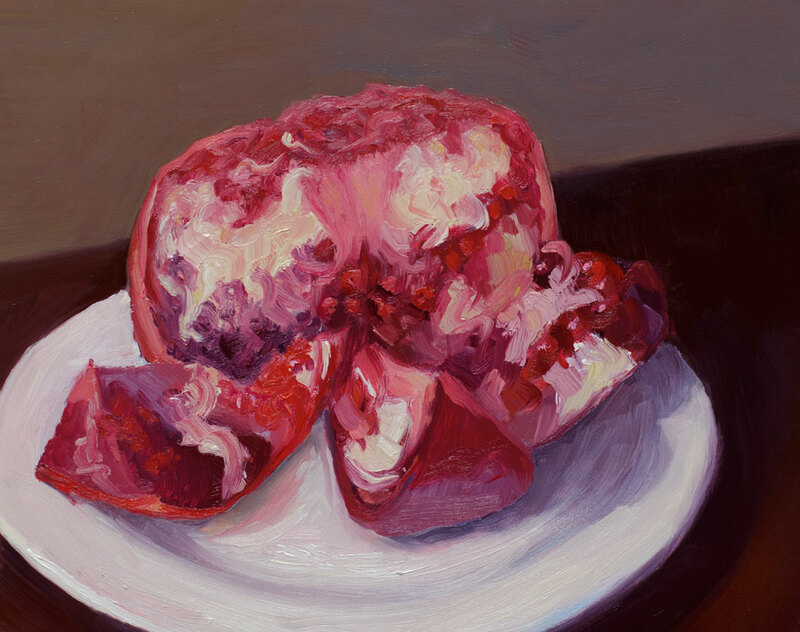 Pomegranate value study in oils, 8x5"
I only had enough energy to be in the studio for a couple of hours a day but fortunately the pom waited nicely for me. 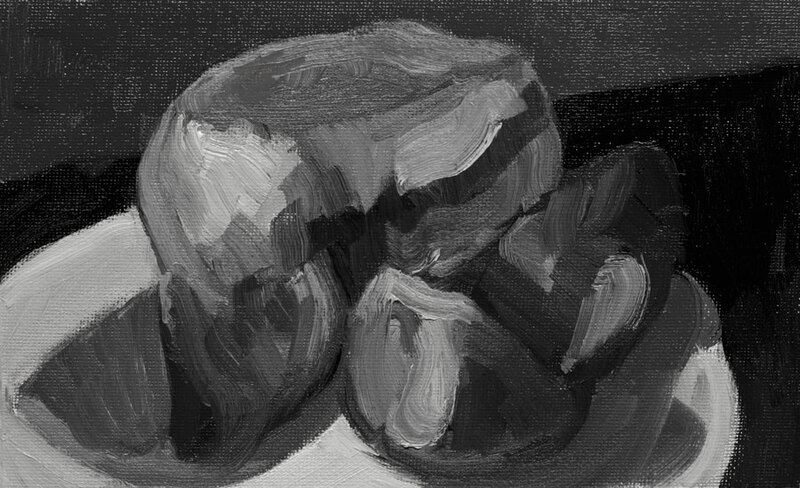 I started by doing a value study in oils (above), trying to sort out where the darkest darks and lightest lights are and just how dark and light they are. 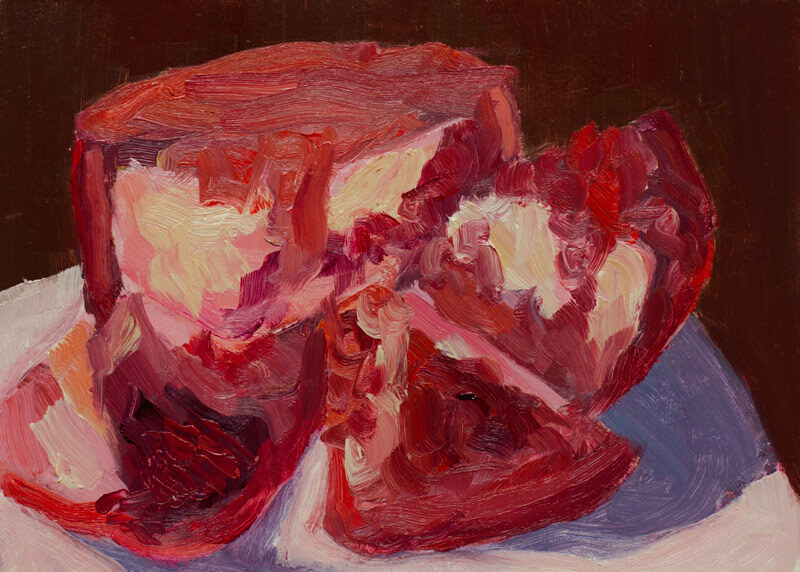 Pomegranate quick study, oil on board, 5x7"
I did a small study next since I knew I didn’t have more than an hour or so of painting energy. I had fun with this and feel like I’m starting to find a way to get loose and sketchy with oils. I used a GE Reveal light bulb in my lamp which gave everything a pinkish-lavender cast and that’s why I named the painting “Pomegranate Revealed.” GE says they are “specially made to filter out the dull yellow rays produced by standard incandescent bulbs.” I’d bought it originally thinking it would simulate daylight but it doesn’t at all. I usually use a fluorescent 5000K bulb 40 watt bulb (equal to 150 watts) which does a better job of producing clean light. 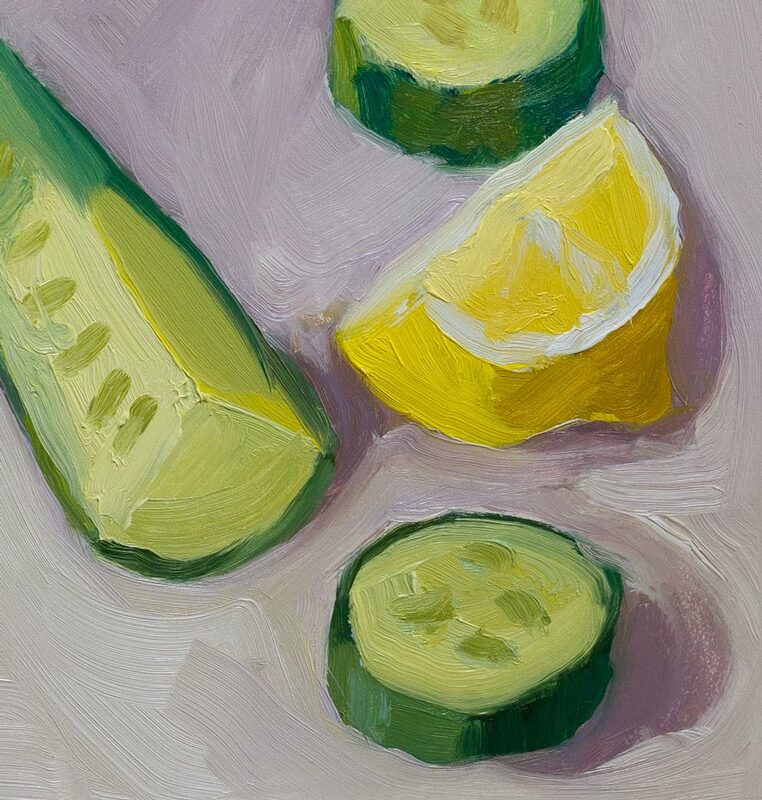 Cropped in Photoshop to 8x10"
When I compared the final painting and the studies I realized I liked the original composition with less background better so I experimented with cropping the painting in Photoshop. It’s not hard to cut the board down if I decide to crop it for real. What do you think? Do you like this cropped version or the “final” version at the top of the post better? I just needed to sketch something, anything, yesterday, and this rubber tree plant outside my studio window was glowing in the sun. My son Robin gave it to me as a housewarming gift 10 years ago when I bought my combo home/studio (a duplex; one unit is my house, one is my studio). The plant got too big for the living room so I cut half off half and stuck that in the ground. I took the other half to my office. The plant in my downtown Oakland office is sorely abused but just keeps on growing anyway. I spent most of the day yesterday working on rebuilding my website which seemed like a very indoor thing to be doing on such a sunny day. 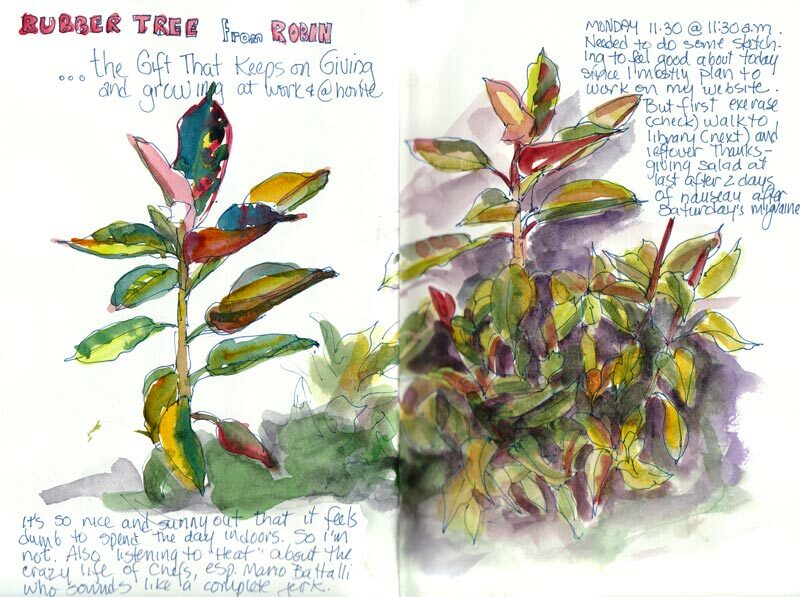 But after sketching outdoors for half an hour I realized how deceptive that sunshine was: it was cold out there! And then I was happy to be indoors. Yesterday I signed up for Bookbinding I on January 9-10 at the San Francisco Center for the Book. Maybe when I can bind my own sketchbooks I’ll be able to make one that fits on my scanner and doesn’t leave a big blurry section in the middle. While I love the Fabriano Venezia sketchbooks I’ve been using the past 6 months or so, they’re just half an inch too big to fit. 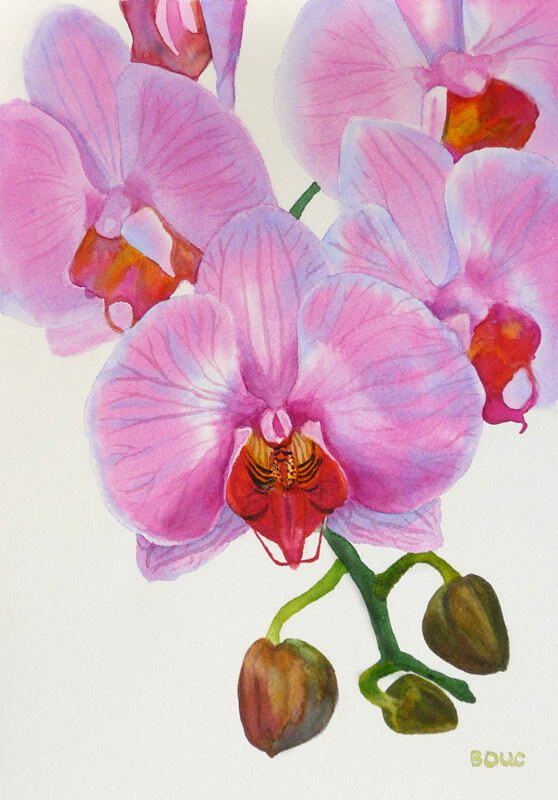 Orchid in watercolor #2, 12x9"
On Wednesday night I completed the last page in a sketchbook with some writing about the frustrating process I’d been through with the orchid painting. 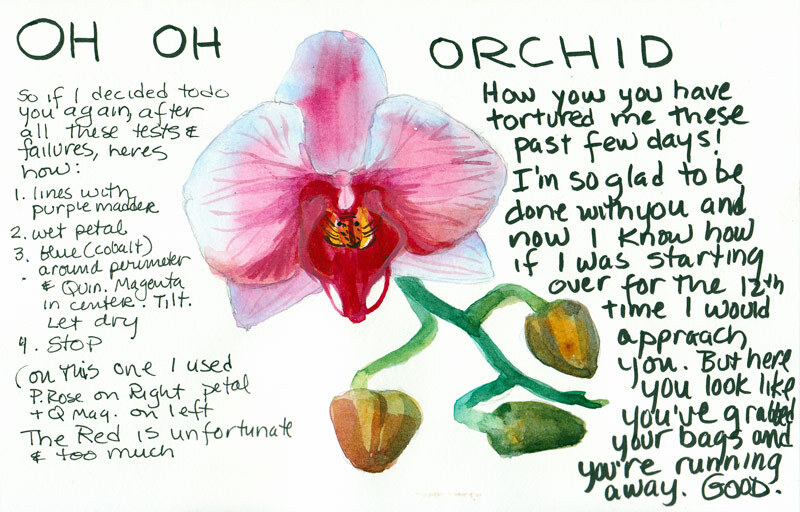 And then, as I did one last sketch of the orchid in the book (below) I realized how I might be able to actually make the painting I’d originally envisioned. It would be one I could do simply and be able to write about as the six-step process the publishers needed. When I woke up on at 6:00 a.m. on Thanksgiving morning I realized I had to give it another try. The image above is the happy result. Here is one of the MANY pages of tests and samples I made in trying to find the right pigment combinations to make this painting work. 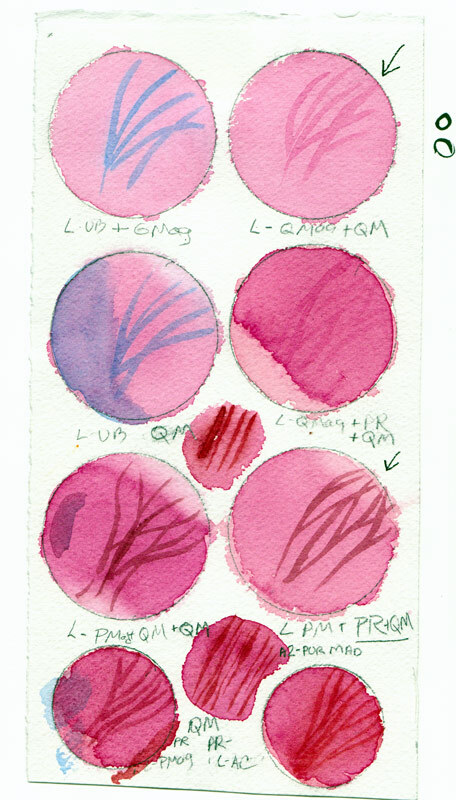 I decided the pigment that gave me the color I wanted was Winsor Newton’s Quinacridone Magenta but like most quinacridones, it wasn’t very civilized, trying to spread everywhere. 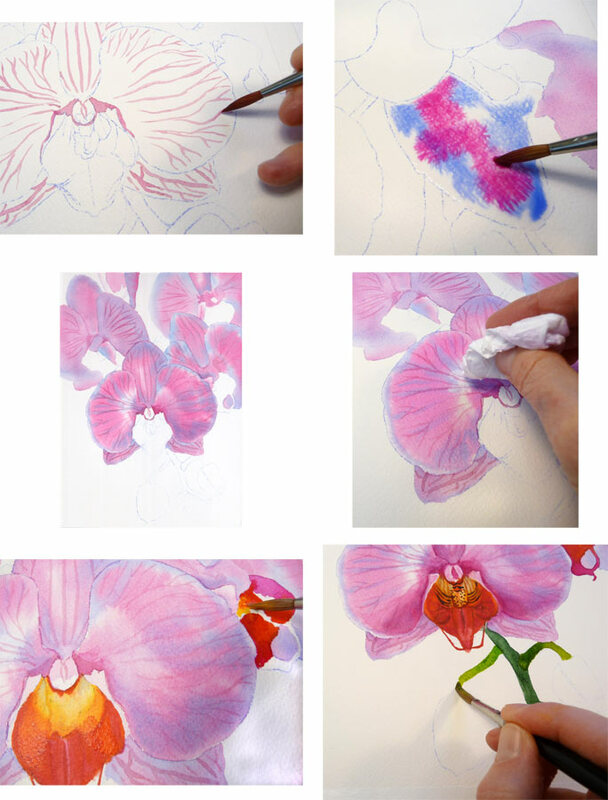 What finally worked was painting the veins first on dry paper, wetting a petal, painting cobalt blue just inside the perimeter and then dropping in the Quinacridone Magenta in the center, letting it spread and then blotting up a bit of the paint as needed. At least someone got to relax in the sun. 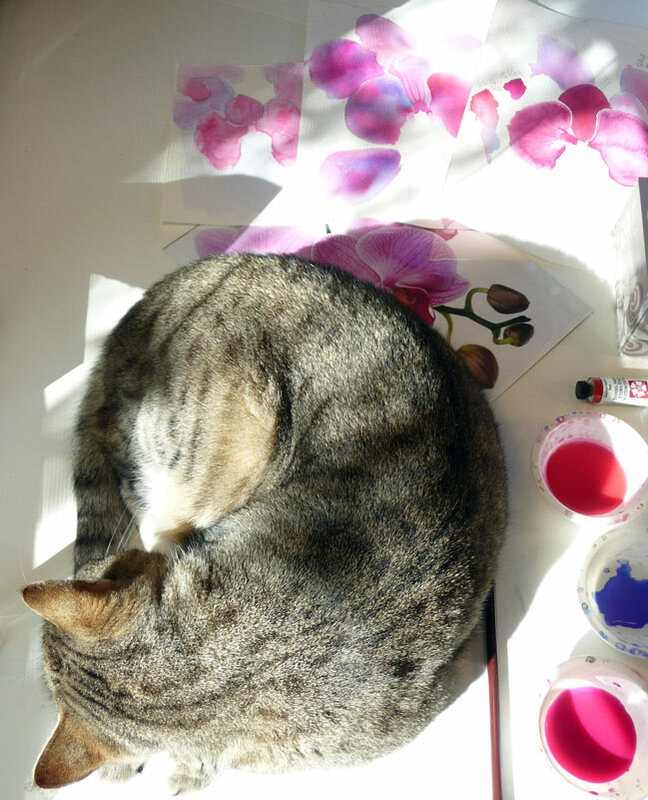 When I left to make a cup of coffee Busby napped amidst the orchid chaos on my desk. You can see the original reference photo peeking out from under him, with a pile of false starts at the painting behind that.